Figure 1. Tau protein is expressed in mouse brain but absent in HeLa cells. 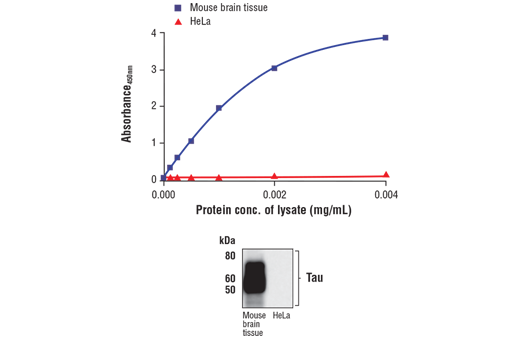 The relationship between lysate protein concentration from mouse brain and HeLa cells and the absorbance at 450 nm using the FastScan™ Total Tau ELISA Kit #57519 is shown in the upper figure. The corresponding western blot using a Tau antibody is shown in the lower figure. Mouse brain tissue or unstarved HeLa (90% confluence) cells were collected and then lysed. The FastScan™ Total Tau ELISA Kit is a sandwich enzyme-linked immunosorbent assay (ELISA) that detects endogenous levels of Tau. To perform the assay, sample is incubated with a capture antibody conjugated with a proprietary tag and a second detection antibody linked to HRP, forming a sandwich with Tau in solution. This entire complex is immobilized to the plate via an anti-tag antibody. The wells are then washed to remove unbound material. TMB is then added. The magnitude of observed signal is proportional to the quantity of Tau. Antibodies in kit are custom formulations specific to kit. The FastScan™ Total Tau ELISA Kit detects endogenous levels of Tau as shown in Figure 1. This kit detects proteins from the indicated species, as determined through in-house testing, but may also detect homologous proteins from other species. Tau is a heterogeneous microtubule-associated protein that promotes and stabilizes microtubule assembly, especially in axons. Six isoforms with different amino-terminal inserts and different numbers of tandem repeats near the carboxy terminus have been identified, and tau is hyperphosphorylated at approximately 25 sites by Erk, GSK-3, and CDK5 (1,2). Phosphorylation decreases the ability of tau to bind to microtubules. Neurofibrillary tangles are a major hallmark of Alzheimer's disease; these tangles are bundles of paired helical filaments composed of hyperphosphorylated tau. In particular, phosphorylation at Ser396 by GSK-3 or CDK5 destabilizes microtubules. Furthermore, research studies have shown that inclusions of tau are found in a number of other neurodegenerative diseases, collectively known as tauopathies (1,3). Johnson, G.V. and Stoothoff, W.H. (2004) J Cell Sci 117, 5721-9. Hanger, D.P. et al. (1998) J Neurochem 71, 2465-76. Bramblett, G.T. et al. (1993) Neuron 10, 1089-99.